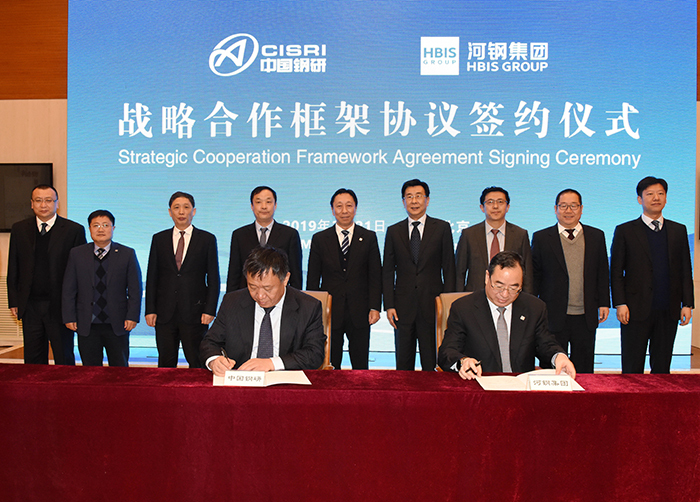 March 21, HBIS and CISRI signed their Strategic Cooperation Framework Agreement in Beijing to strengthen their mutually beneficial and complementary coordinate innovation. They will develop new steel science and technologies and applications that could benefit industry, academy and R&D communities. The will lead the development of the industry and serve key national strategies. HBIS CCP & Group Chairman Yu Yong, CISRI CCP & Company Chairman Zhang Shaoming attended the ceremony and HBIS Vice President, Chief Technology Officer, CISRI Member of CCP Standing Committee, Vice President Li Bo signed the agreement. CISRI Member of CCP Standing Committee Zhang Jianwu hosted the ceremony. Before the signature, Yu Yong met Zhang Shaoming and said the two companies had worked closely and CISRI had provided great assistance to HBIS efforts of reform and product upgrades. HBIS is now carrying out its client oriented product upgrade project, thus needs the professional support of CISRI in training, technological innovation. HBIS is also providing application opportunities for CISRI new technologies. HBIS wishes that the teams could continue their communication and take advantages of their resources to improve their nation’s industry. Zhang Shaoming said CISRI had been dedicated to national defence, military industry, energy, metallurgy and high end manufacturing. Exploring new opportunities, CISRI will develop new applications and innovation to provide more value added services to HBIS. The new agreement will allow the two companies to implement the national innovation driven development strategy. Take the new science and technology reform, new chapter of world’s innovation to promote the upgrade of the country’s steel industry to a high quality development.They will focus on new metallurgical procedures, new metal material, hydrogen energy industrial application. They will perform coordinated innovation and build a long term structure to improve the mutually beneficial and complementary development and make a highly merged platform that could connect the R&D and the industrial applications.